got pampered to a 10 minute Thai head and neck massage , especially after a rush in traffic; which was so required. 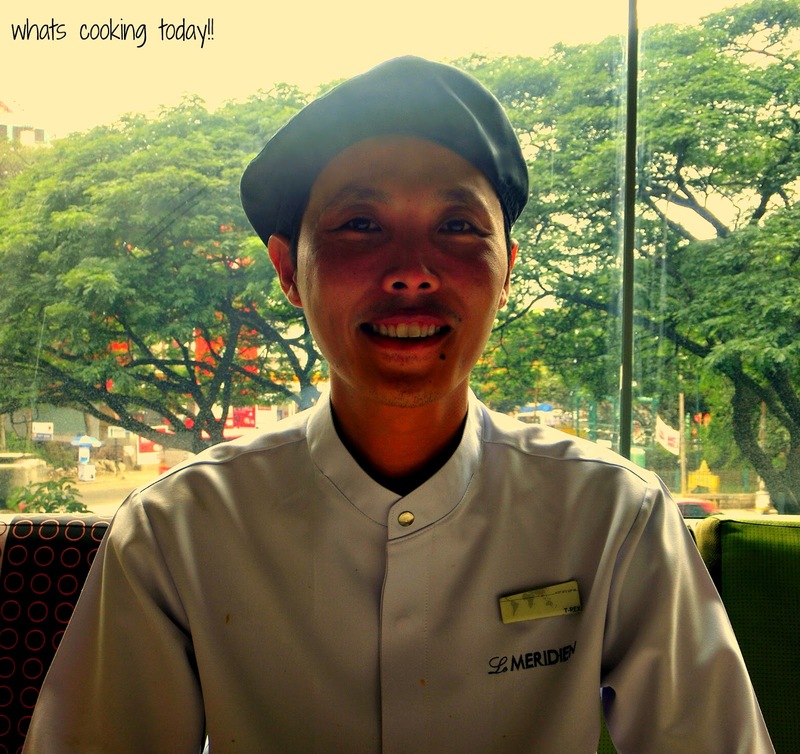 Chef Sumet or T REX (meaning little boy in Thai) brings to you his finest and some authentic style Thai food to you on request. The Thai food is essentially known to have the four main seasoning which is salty, sweet, spicy and sour. The dishes that were brought had every element being in it. 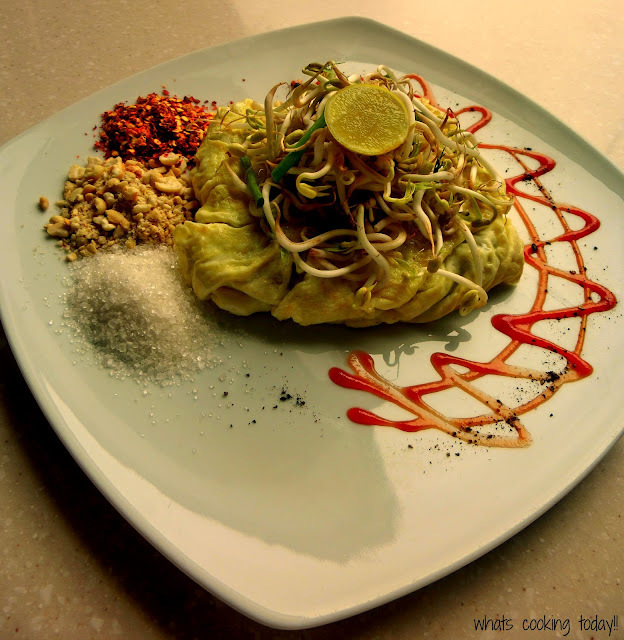 We were definitely wooed by his two main dishes that were Pad Thai, which comes packaged in an omelette. The Pad Thai was stir fried with prawns in a fish sauce, wrapped in a delicate omelette and topped with some fresh crunchy bean sprouts and served along with the condiments of chili flakes, sugar, crushed peanuts and lime. The looks of the Pad Thai itself make you salivate. 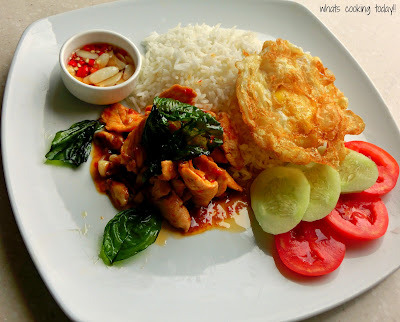 Next up the Chef treated us to another one of his live creations which was the Pad Kra Prao topped with the Kai Khai Dao, a chicken stri fry with basil leaves served with rice and a thai style fried egg. To describe the dish I would say - Sumptuous .The Buffet holds store some other fantastic dishes such as the Keany Curry Pla which is a Yellow Fish Curry and Keang Pad Je which is a Spicy Red Vegetable Curry in the Mains. There is the soups sections which offers two really hot and spicy options such as Seafood Galangal Soup and a Thai Hot and Sour Soup. 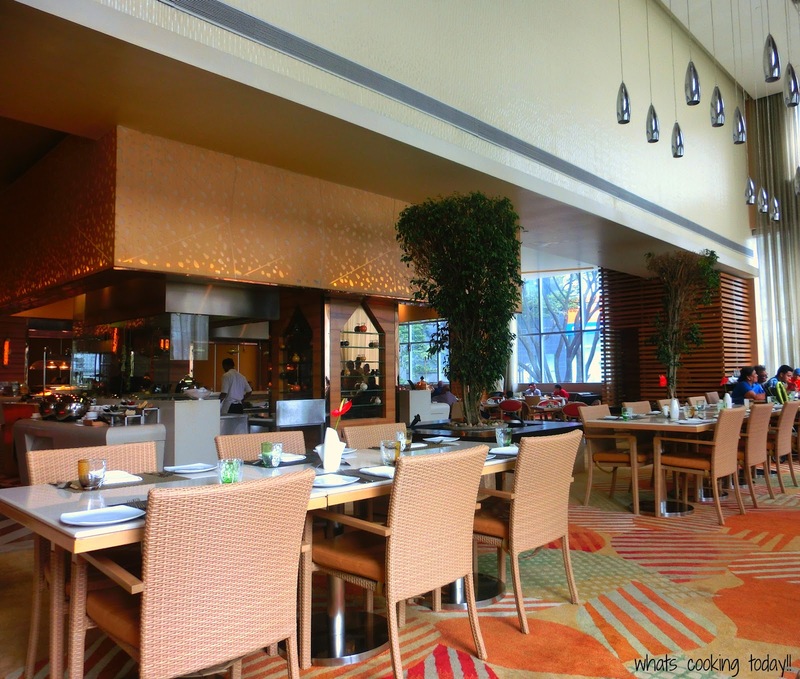 Not to mention there is a live station where the guests can meet their craving of meat or seafood along with their noodles. 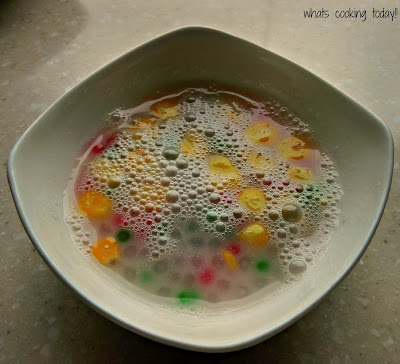 For Dessert there was the Warm Sago and Corn Kernals in a sweet coconut milk which I found a tad too sweet. Never the less to bring down that sweetness you need a bite of the Khanom Mo Kaeng which is Mung Bean Custard topped with savory fried onions. The subtleness of this custard and the savoriness of the fried onions just brings about a perfect harmony. A perfect ending to a good meal. What I liked about the dish was that what seemed like a garnish is so vital and elemental to the custard. 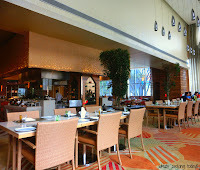 So get going to a feisty cuisine at the Feast Sheraton Bangalore located at Brigade Gateway for a Lunch Buffet priced at INR995 or for Dinner Buffet at INR1145 exclusive of taxes respectively until 26th July, 2012. So hurry while the festivity lasts! A special mention for Akhil the Restaurant Manager at Sheraton, Praveen and Nithya of Sales at Sheraton Bangalore, the most patient the waiter Manish for having hosted us. This is one dish my mom's elder sister is a pro at! I love the way Remaniammama makes her chakkakuru mezhukkuperruti. I have eaten her dish way too many times, for sure I love the way she does it because there is alot more love added when she does it for us! 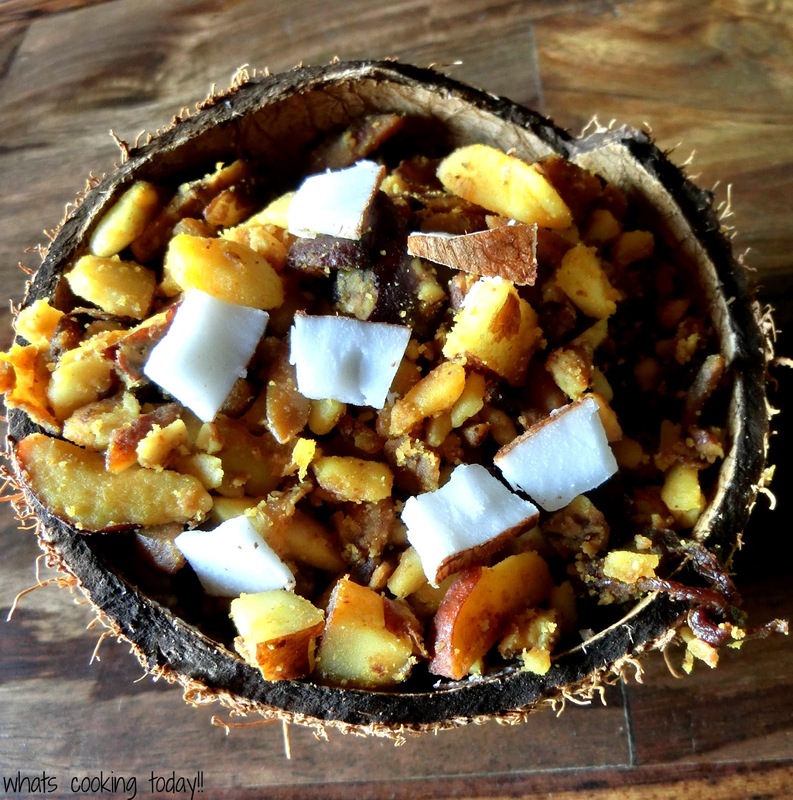 Peel the white outer cover off the jack fruit seeds. Then soak them in water for about 2 hours and then remove the brown layer. Alternatively the seeds could be pressure cooked in water and salt for a speedy process. Once the brown layer is off, cut them lengthwise. Into a pan, pour some oil and tip in the garlic and saute for a minute. Add in the jack fruit seeds, along with the turmeric, chili powder,coconut slivers and salt if not added.Saute for about 4-5 minutes on medium heat. Add about a quarter cup water. Cover and cook till the seeds are al-dente. Once the water is evaporated, fry the seeds till they are slightly crispy. Check for seasoning and add more salt if required. 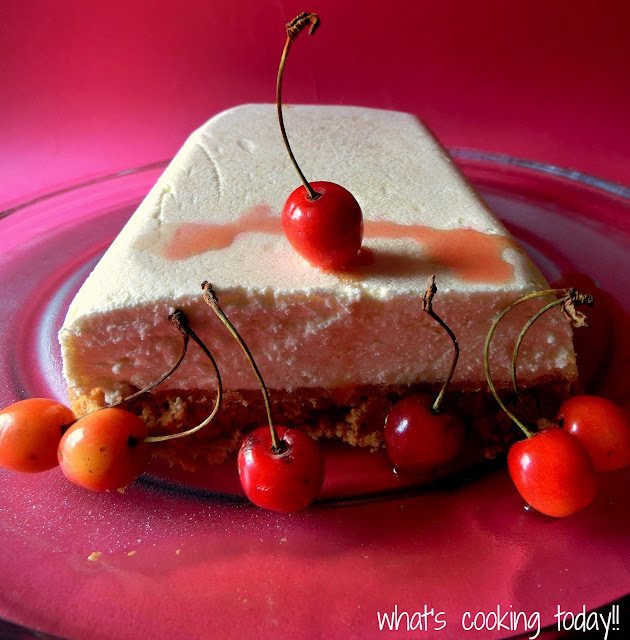 No use of gelatin and the cheesecake is easy to set. My favorite recipe book which is the Delicious Wicked Desserts and this one I vote as simply creamy and delightful! Brush the insides of a 450gm loaf tin with water and then line with cling film. Melt the chocolate into a heat prrof bowl, over a pot of simmering water. Take it off and then stir till smooth and leave to cool slightly. Into a separate bowl beat the mascarpone cheese and and fold in the cream. Spoon into the tin and level it slight. Place in the refrigerator to firm about an hour.Meanwhile proceed to make the biscuit base, mix the crushed biscuits with the butter and spoon the mixture over the firm cheesecake mixture and press lightly to level. Place in the refrigerator to firm up for 4 hours or until set. To make the cherry sauce, measure out 100ml of water and mix in 1 tablespoon of the arrowroot powder to make a paste. Bring the remaining water to boil in a pan with the brandy or casis, orange zest, juice. Stir in the paste and simmer till clear and thick. Add in the cherries and simmer for about 3minutes.Allow to cool. To serve. invert the cheesecake over a plate and slice into 8 slices and serve with the cherry sauce. The Masterchef series this season is absolutely fantastic. What I look forward to are the episodes on the masterclass. So in one of the episodes, Gary Mehigan demonstrated this fantastic and beautiful tart. I was mesmerized by the whole thing and decided 'am gonna give this a go! 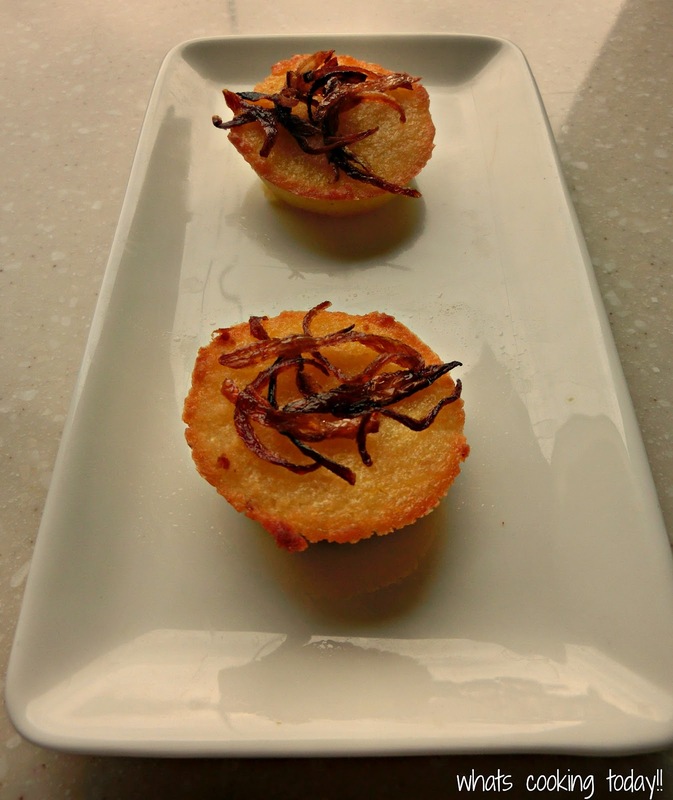 So I went to Food Hall located at No.1 MG Road, which is a gourmet store and bought everything I needed for this tart. I tell you this tart could be wickedly addictive!!! Preheat the oven to 160°C. For pastry, place butter, sugar and salt into a food processor and process until creamy. Add flour and process until coarse breadcrumbs. Add egg and yolk and process for 10 seconds or until the dough comes together to form a ball. Tip pastry onto a lightly floured bench and bring together with hands. Flatten gently into a flat rectangular shape and wrap in plastic film. Refrigerate for 20 minutes to rest. Roll rested dough to 3mm thick and wrap loosely around a rolling pin. Gently roll over a 9 inch fluted round tart tin with a removable base and press pastry into tin, moulding pastry up the sides of the tin with your fingertips, fill in any cracks with excess dough. Remove any excess pastry with your thumb by pressing down along the edges of the tin. Refrigerate for 30 minutes. Place a sheet of baking paper into the chilled pastry in the tart tin, half-fill with baking beads or rice and bake for 12-15 minutes until edges are light golden. Remove weights and baking paper and bake for 5-10 minutes or until base is dry. Set aside. For pistachio crumble, place pistachios in the chopper attachment of a stick blender and process to a meal. Add sugar and flour and process to combine, transfer to a bowl. Rub in butter with your fingers, leaving some small lumps of butter. Line a baking tray with baking paper, tip crumble over tray and spread evenly. Bake for 5-7 minutes or until just golden. Set aside to cool. For pistachio paste, process all the ingredients together until smooth and creamy. Add a little water if too dry to come together. For frangipane filling, whisk butter and sugar in an electric mixer until creamy. With the motor running, add eggs and egg yolk, one at a time, continuing to mix after each addition. Add almond liqueur, lemon zest, ground almonds, flour and pistachio paste and whisk until combined. 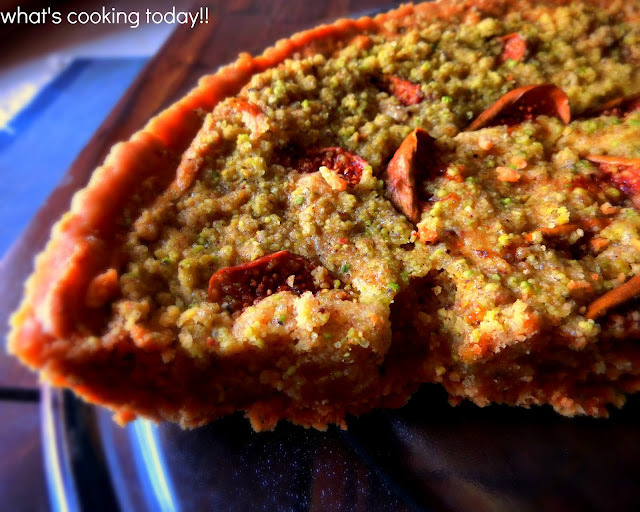 Spoon almond mixture into tart shell until ¾ full. (Left over frangipane can be stored in an airtight container in the fridge for up to a week). Gently press in fig wedges, placing them at regular intervals along the tart. Bake for 30 minutes or until golden. Remove tart from oven, brush with warm honey and leave to cool. 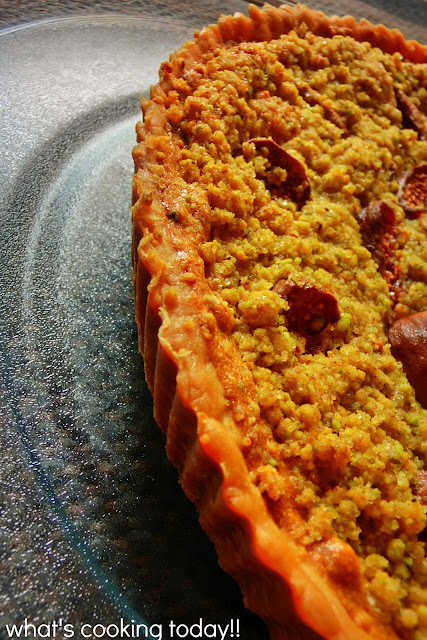 Sprinkle the crumble generously over the tart and serve with clotted cream on the side. Soak the rice in water, rinse well and drain. Cook the rice in salted water till soft and tender and keep aside. In a pressure cooker, place the veal cubes along with some salt and pepper. Cook till the veal cubes are tender. Meanwhile into a pan, pour some oil, and splutter the whole spices - cardamon, cinnamon stick, cloves, peppercorns. Then saute the onions till evenly browned. Add in the garlic and ginger. Saute till fragrant and then tip in the green chilies.Add in the chopped coriander and mint leaves, reserving a handful of coriander for the final garnish. Cook till the leaves are wilted and well mixed with the onion. Add the tomato paste and cooked veal and fry well. If the meat while cooking turns dry, add about a less than a 1/4 cup of of the veal stock from the pressure cooker or water to moisten the dish a little bit. Into a large casserole, layer in the rice, and the cooked veal and add the saffron milk mixture and gently mix the rice and the veal in. 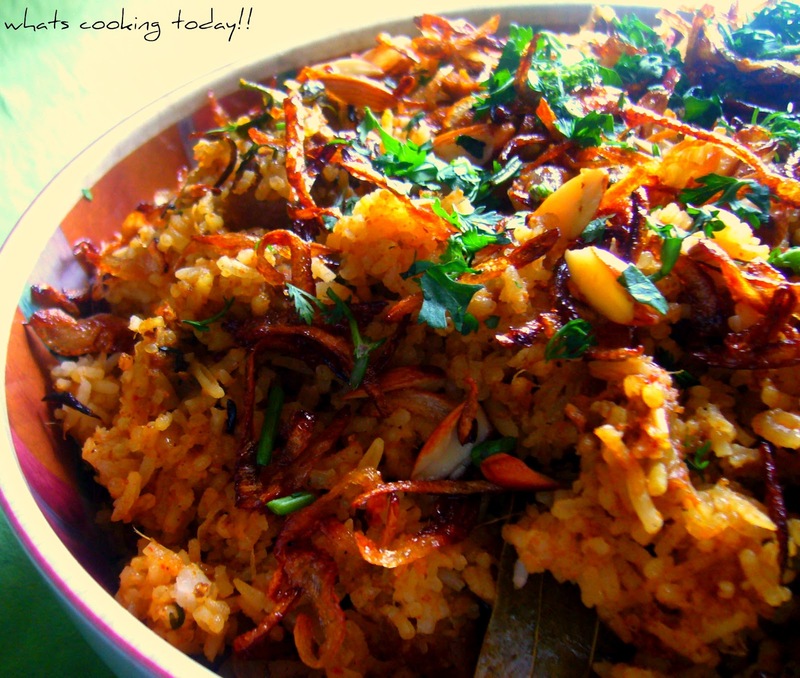 Layer the top of the rice with fried cashew nuts, raisin and sultanas and some fried onion. 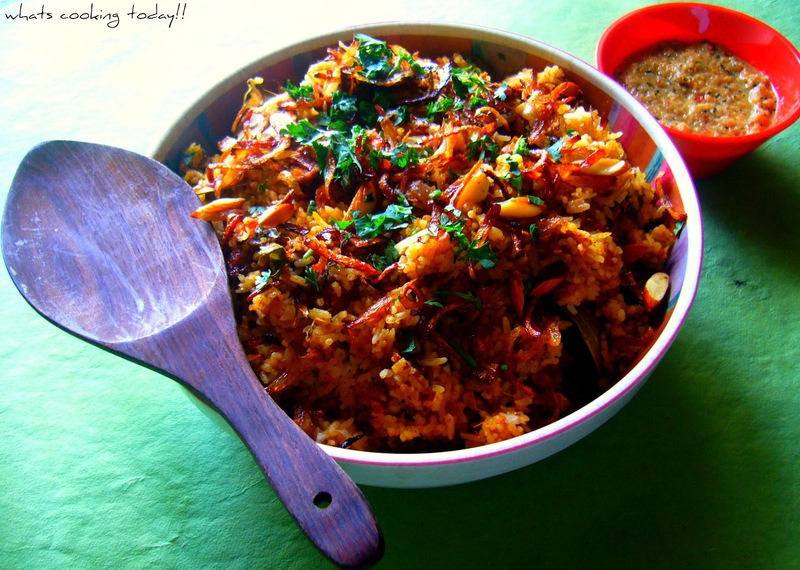 Cover the casserole and bake in the oven for about 30 minutes at 140 C. Once out from the oven, add a handful of freshly chopped coriander and the biriyani is ready! 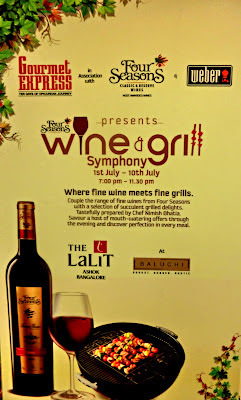 The monsoon brings you some succulent and enticing grills along with the pairing of Four Seasons Wine, laid out for the Bangaloreans from July 1 till July 10, 2012. 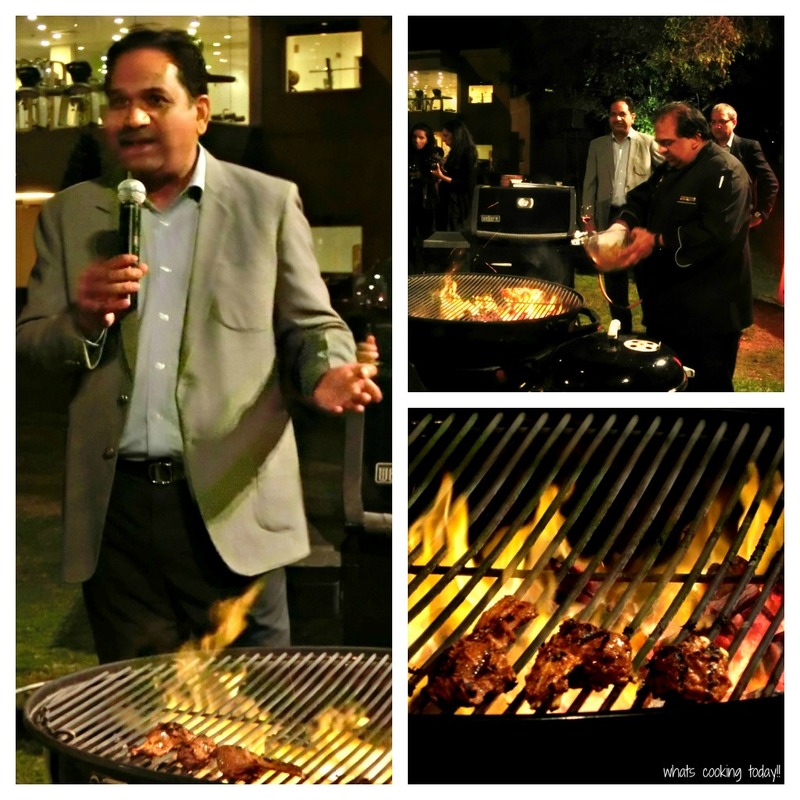 Chef Nimesh Bhatia the Regional Executive Chef takes you through some excellent non vegetarian and vegetarian delights, like the Mirch Masale Ki Sabot, Khush Mahak Jheenga, Kacche Koyale Ka Khargosh, Khumb-hi-khumb, Sataver Aur Hari Gobi Ki Tikki prepared on the Weber Grill. Mr Abhay Kewadkar - Chief Wine Maker and Director Four Seasons Wine explained the nuances of pairing the char grilled dishes with the full bodied complex Four Seasons from the Barrique Reserve Range which are Shiraz and Cabernet Sauvignon. 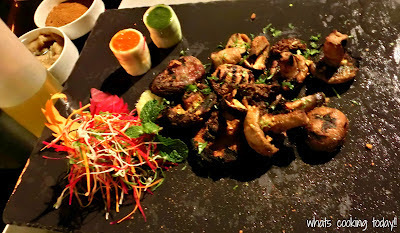 Baluchi stands out for its delight on the palate with the variety of kebabs, shorbas, rotis and fragrant rice dishes. This season it opens its perfect setting to a 10 day long festival of only the best gastronomic experience of perfect grilled delights and Premium Wines to make it complete, so be there to enjoy it because I indeed did on the Preview of the Event. 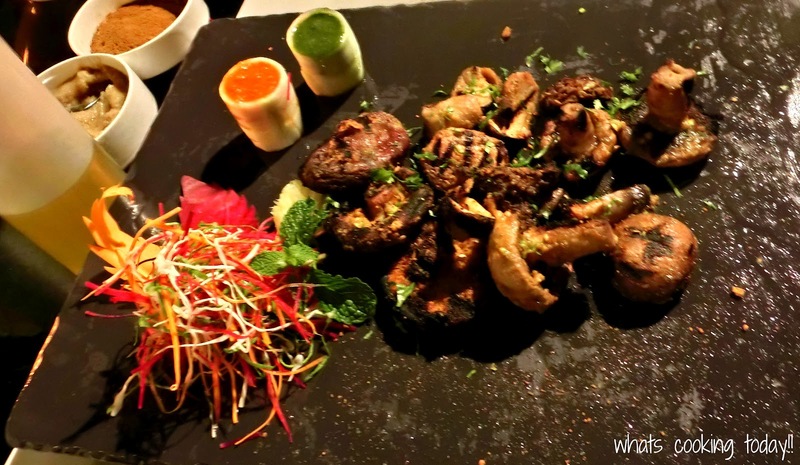 The meal was justifiable with the Shiraz and generous portions of shrimps, the grilled rabbit, stuffed chicken and mutton .